MANY SCHOOLS AROUND the country have been closed today due to severe weather conditions caused by heavy snowfall overnight. A Status Yellow snow and ice warning was issued for the whole country until 3am last night, covering many areas in a blanket of snow. This has left many people in rural parts of the country stranded this morning. The sub-zero conditions have made the roads treacherous for drivers, who are advised to completely clear their cars of snow and ice if they decide to take off this morning. Drivers are also being warned to only drive through water if they know it’s not too deep. A number of schools in Monaghan have been closed this morning as a result of heavy snowfall throughout the night. St Louis Secondary School in Monaghan is closed “because of the snow and treacherous road conditions”. A statement on the school’s Facebook page said that updates will follow. St Maccartan’s College in Mallaghmurphy confirmed on social media that it will not be opening today “due to the adverse weather, dangerous road conditions and the fact that there is no school transport service” available this morning. Students are being sent work online by teachers. Beech Hill College in Monaghan has also closed its doors today due to the weather conditions. A list of other schools closed in Monaghan today can be found here. Parents and guardians are being advised to contact their child’s school for updates regarding closures. A flood warning has also been issued for certain coastal counties, and the promenade in Salthill has been closed as a precaution against flooding, according to AA Roadwatch. 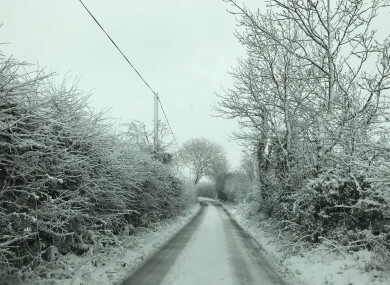 Icy conditions are being reported around Portlaoise, Co Laois; Nenagh, Co Tipperary; and Stepaside Lane in Stepaside is closed due to icy conditions. Louth County Council said that snow ploughs would be issued on certain routes and to make way for gritting vehicles. It also advised people to drive only if your journey is necessary. The counties Donegal, Galway, Leitrim, Mayo, Sligo, Clare, Cork, Kerry and Limerick have been warned to take care of “high or very high” seas, which are going to affect the Atlantic Seaboard over the next few days, leading to an increased risk of coastal flooding. Email “Some schools have closed today because of heavy snowfall and icy road conditions”. Feedback on “Some schools have closed today because of heavy snowfall and icy road conditions”.